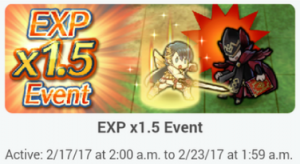 Fire Emblem Heroes EXP Bonus Event! This one snuck up on us! If you log into your Fire Emblem Heroes account, (or check your Bulletin Board if you’re already logged in), you’ll see an announcement letting players know that from now until February 23 (0200 EST), that there will be a 1.5x EXP Bonus applied to all battles in Story Maps, Special Maps, the Arena and the Training Tower. There is still a limit to just how much a unit can acquire at maximum, but this will certainly help players train up their units for the next several days! Of course, the day after my units hit lvl 40.